Marsh, James H.. "Tecumseh and the War of 1812". The Canadian Encyclopedia, 25 January 2019, Historica Canada. https://www.thecanadianencyclopedia.ca/en/article/tecumseh-the-savior-of-upper-canada-feature. Accessed 21 April 2019. On October 4, 1813, the eve of the Battle of Moraviantown, the great Shawnee chief Tecumseh had a foreboding. Our lives are in the hands of the Great Spirit, he said, We are determined to defend our lands, and if it is His will, we wish to leave our bones upon them. On October 4, 1813, the eve of the Battle of Moraviantown, the great Shawnee chief Tecumseh had a foreboding. "Our lives are in the hands of the Great Spirit, he said, "We are determined to defend our lands, and if it is His will, we wish to leave our bones upon them. In the moments before the battle began the next morning, Tecumseh passed along the British lines. In his handkerchief, rolled as a turban over his brow, was placed a handsome white ostrich feather. What fate had brought Tecumseh to a battleground in Canada, so far from his place of birth on the Scioto River south in the Ohio Valley? Tecumseh (Painting by W.B. Turner/Metropolitan Toronto Library). 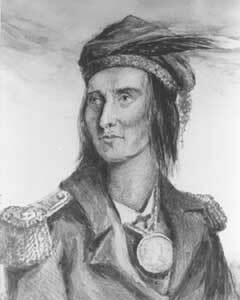 From earliest childhood Tecumseh regarded the Americans as his enemies. Americans, whom the Shawnee called "Big Knives for the swords they carried, seized the Shawnee hunting grounds, killed Tecumseh's father and destroyed his villages. In 1786 the Shawnee were forced to sign a treaty surrendering almost their whole territory, an area now comprising eastern and southern Ohio. By 1795 Tecumseh was a war and civil chief, engaged in the futile struggle to preserve his people. The new century found the Shawnee sinking into poverty, strife and disease. Following his brother Lalawéthika's preaching to return to traditional ways, Tecumseh put aside his European clothes and chose a new home for his people on the Wabash River, below the mouth of the Tippecanoe River. When in 1809 the relentless American hunger for land again uprooted the Shawnee, an infuriated Tecumseh began traveling throughout the Ohio Valley to rally the tribes in a common defence. He tirelessly moved from nation to nation, trying to unite ancient rivals and peoples whose languages were unintelligible to one another. In 1811 William Henry Harrison wrote that Tecumseh's ability to inspire loyalty among such disparate peoples "bespeaks him one of those uncommon geniuses which spring up occasionally to produce revolutions and overturn the order of things. He spoke vehemently of the wrongs imposed by the white people and exhorted the Indians to fight. 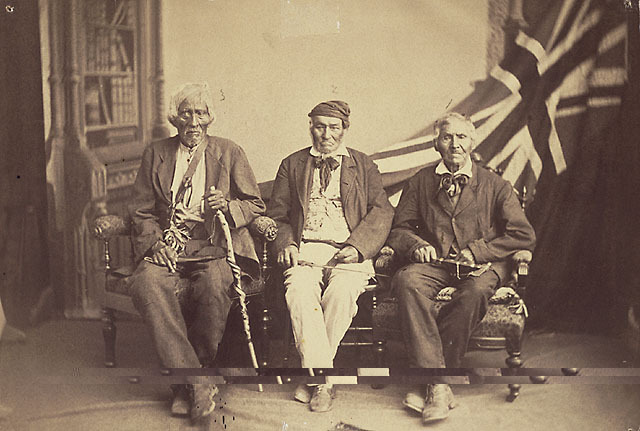 When war broke out between the United States and Britain in 1812, it was clear where Tecumseh's loyalty would lie. He took his warriors to Canada. Tecumseh's leadership changed the whole complexion of the campaign. Joined by General Isaac Brock, the Indian and British allies routed the Americans and captured Fort Detroit itself on August 16, 1812. Hull and 2188 men surrendered. At one stroke the threat to the western flank of Upper Canada was obliterated. Throughout the campaign Tecumseh bravely led his confederacy into battle, adroitly outmaneuvering superior numbers. On May 13, 1813 he won another decisive victory in the woods at Fort Meigs. Brock called him the "Wellington of the Indians. "A more sagacious or more gallant warrior does not, I believe, exist, he wrote. Alas, Brock was soon dead on the battlefield at Queenston and following the American naval victory at Put-in-Bay, another American army invaded Upper Canada. It was this force of some 3500 men under General William Henry Harrison that confronted Tecumseh and the British on October 5, 1813 on the Thames River at Moraviantown. The British general, Henry Procter, fled on horseback and his dispirited redcoats broke ranks and surrendered. Tecumseh had placed his own men well, hidden in the thickets of a swamp. When a second battalion of Americans advanced, the Indians rose from cover and delivered a crushing volley. Tecumseh sprinted forward to inspire his followers but was shot and killed. Such was his fame that many claimed to have fired the fateful shot. Without their leader, Tecumseh's men surrendered. Fortunately, the Americans returned to Detroit and did not exploit their victory on the Thames. Tecumseh's inspired leadership and brilliant victories were decisive in the defence of Canada, which survived the war independent of the United States. But Tecumseh had not fought for the British but for his own people. Canadian (and American) historians and novelists have sung his praises, but his most enduring legacy is among the First Nations, for whom he is the ultimate symbol of courage, endeavour and fraternity.